This is the sleeveless version of my TNT cowl neck blouse(TNT/CNB). I compared my TNT/CNB to McCall's 6078 and made minimal adjustment. I added a front self facing lining that was not included in the pattern. Here is the tutorial that I followed when constructing my TNT/CNB. Labels: TNT- Cowl Neck Blouse. 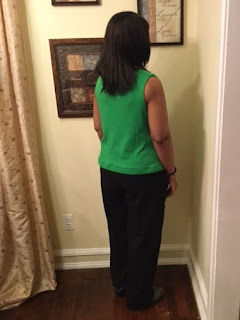 That green is gorgeous and it looks amazing on you! Beautiful finish! I love how dramatic your cowl neck is and the color is beautiful. Great job! Thank you Jackie. 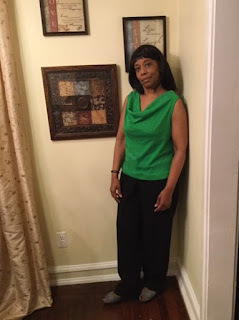 I chose the green color to complement a skirt in my wardrobe and was pleasantly surprise at how well the color complemented my complexion. Now that I think about it I don't have much of that color in my wardrobe. Lovely cowl top and a super great color! Wonderful color - nothing like a great cowl! Love that color and the fabric looks so soft and comfortable. Thank you Faye, I love the color toooooo!